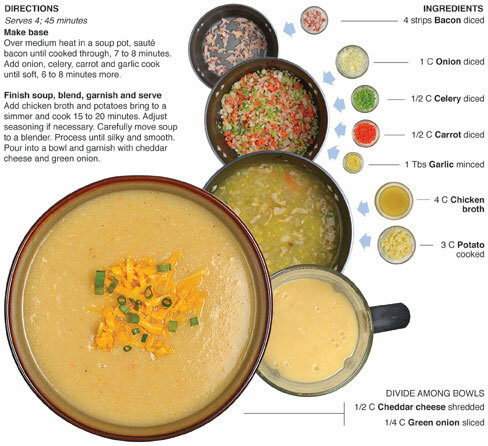 Using bacon in the base of any potato soup is pure culinary gold. Bacon in general is culinary gold, but the smoky hint that it provides next to the mild flavor of potato just seems to be a magical combination! Add the mirepoix and garnishes and BAM - you’ve got a winner on your hands. This soup and the potato skins from my last post are a great combination for a Super Bowl party because it’s like getting two for one. Both are made from the same batch of baked potatoes. Heck, if you get lazy or tipsy on booze while baking the potatoes you can quit right there and have a yummy baked spud if need be. 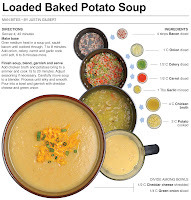 There are many different direction that this soup could be taken, I went with the loaded theme simply because of the extra ingredients I had around. I could have very easily went with potato and leeks. 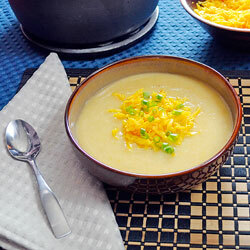 (which is my favorite soup of all-time) Potato soup is a nice compliment to the skins and both are great in any party spread. Over medium heat in a soup pot, sauté bacon until cooked through, 7 to 8 minutes. Add onion, celery, carrot and garlic cook until soft, 6 to 8 minutes more. Add chicken broth and potatoes bring to a simmer and cook 15 to 20 minutes. Adjust seasoning if necessary. Carefully move soup to a blender. Process until silky and smooth. 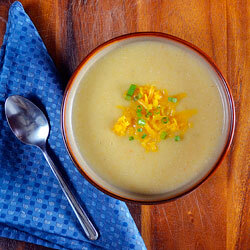 Pour into a bowl and garnish with cheddar cheese and green onion.